Well, I feel like I’ve fizzled out on this so far. 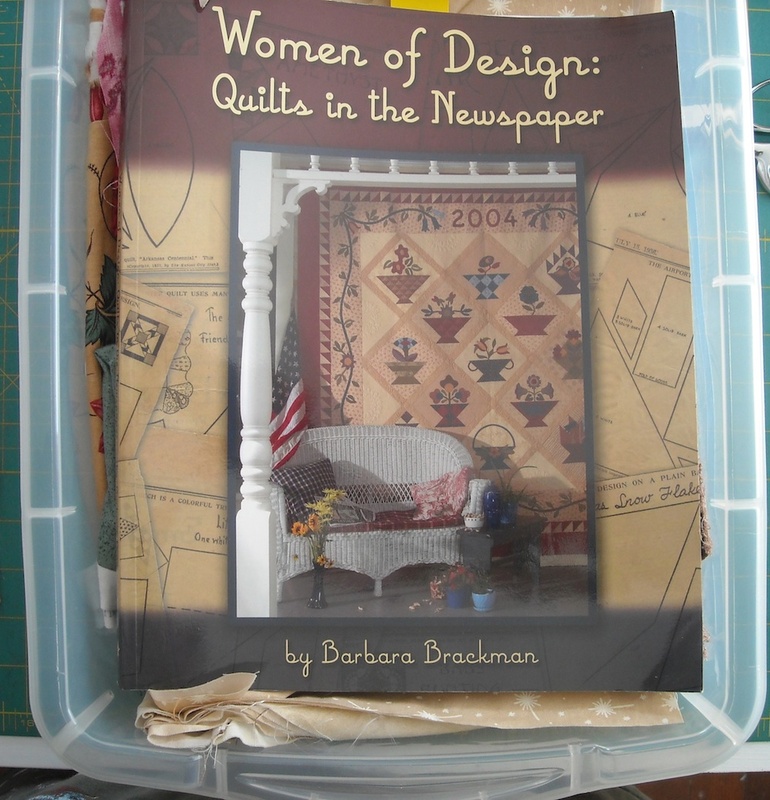 I did locate my January project, it does indeed have a backing ready, and I located the binding for it. But . . . that’s as far as I got. It needs to be quilted, but with the backlog of customer quilts I still have, I simply can’t justify loading a quilt of my own on the longarm unless it has a very important deadline. So . . . it will wait . . . and remain on my list. And it’s time to draw a new number for this month — the number 6. 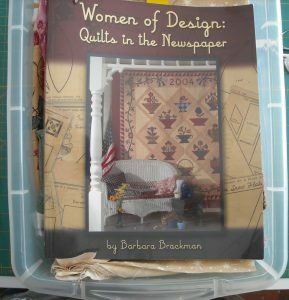 Number 6 on my list is “Women of Design”, a Kansas City Star Block-of-the-Month quilt. Their Block-of-the-Month quilt from 2004, to be exact. I have seven of the blocks made, and everything is all organized neatly in this tub, so it’s my hope that I can make some good progress on this quilt this month. I’ll shoot for a finished top, but even if I just get some more of the blocks made, I’ll be happy! How did you do last month with the project you chose? Are you ready to choose another one? I know some of you did well. Sue sent me a picture of hers that she finished. Isn’t this cute? I love those animal panels. Oh, to be close enough to done to be putting the binding on something — Haha! I’ll pick another project on March 2nd, so my challenge is to see how much I can get done on this one before then. I’m challenging you to pick a project off your list and work on it with me this month, to see how far along we can get with another UFO. Here’s how it works: Procrastination Challenge. I lumped my finishes in with my 350 Blocks blog post but I’ll tell you that I got three tops done. I am still really motivated to move these things out! Good luck to us all, indeed! Well, I did finish a top so my Wip has gone on to my WTBQ pile, so I’m happy about that. And I hope this week to finish another one as I only have one pieced border to finish on it and add the plain last border. How about if you try quilting that UFO on your domestic for 15 minutes a day? 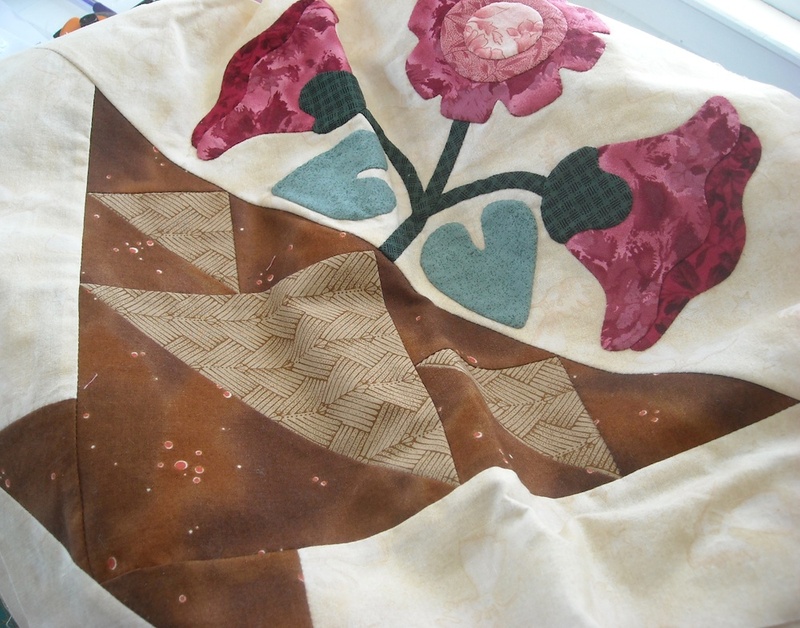 That way you can keep quilting on your customers’ quilts without tying up the longarm. I had to go back and look at the comments from the original post to see what I picked. It was the Christmas BOM which needed two blocks and the border to get to the top stage. Quilting will be down the road – although I have picked a fabric for the backing. (http://pamela.avaraarts.com/wp-content/uploads/2015/01/christmasBOM-top.jpg). So what’s up this month? I want my focus to be on the pre-2007 quilts so naturally I’m working on Orca Bay (2011), but it has a home and is a UFO. For my pre-2007 quilts this month I want to modify a pantograph for Christmas Crazy 8 quilt, get the Thangls BOM quilted (how hard can it be, it’s only 40″ square) and apparently work on the Hancock Star BOM — the suitcase it’s stored in is now in the middle of my room. I know it’s not one, but I’ve never been able to follow the rules when it comes to quilting. Well, I guess I just did that. My grandkids colored pictures on cloth several years ago and I have had them in my quilt room since then to do something with them. So yesterday I made pillow slips out of them for throw pillows for their rooms and have them ready to mail to them. I hope they don’t think they are too grown up for their art work now. I did try to put them on the colors of their rooms now; Bronco blue and orange for my granddaughter and purple, pink and turquoise for my grandson. 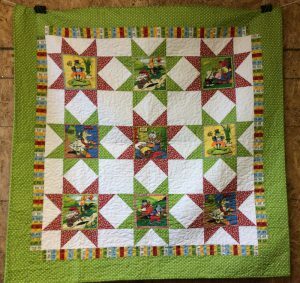 I finished the Bonnie HUnter Grand Illusion top, quilted a baby quilt (piecing was all done) on my machine, pieced and quilted a child’s quilt for Project Linus, and basted another quilt. I also made one of four quilt tops for a colleague out of her husband’s great grandmother’s painted blocks, and have started a quilt that is for somebody’s wedding later this year. 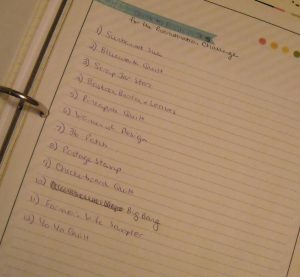 All of these were on my “to do” list, so your challenge helped motivate me to get some partway projects finished so I could start another. Oh, you all are so busy. We are so buried by snow that it is discouraging. We are getting another 12-15 inches AGAIN today. I am still sick. And yes sick of this snow also.. This is being measured out in feet now, not inches. YUCK! I have several Baby Shower’s Between now and late spring, so I will be busy making Teddy Bears, crib quilts, sweater sets and afghans. 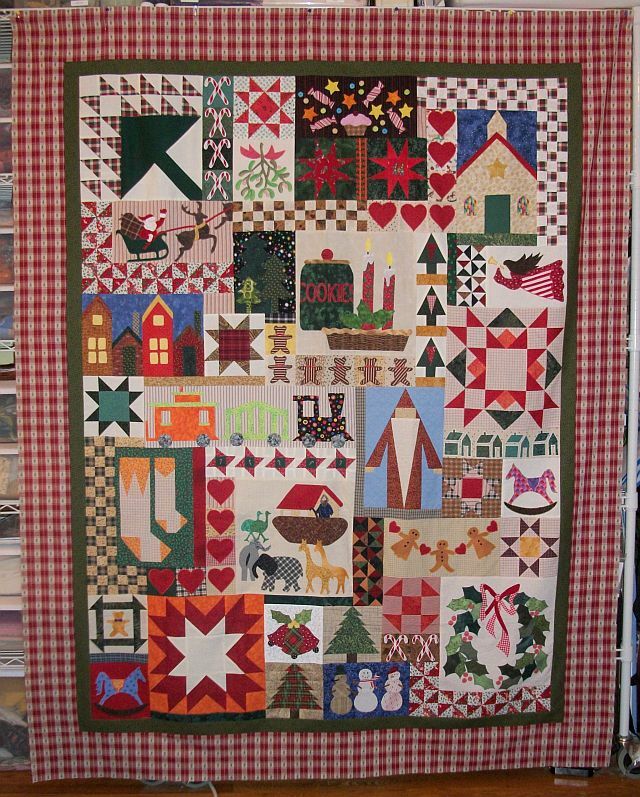 I am in hopes to get back to full quilt making in another month. I picked #1 which is Scrappy Wild Geese, Shelly’s pattern. I have completed one block on Sunday. I have 4 more if I make a twin, 14 more if I make a queen. I guess I missed this part for January, so I am just starting it for February with Jo Morton’s challenge. 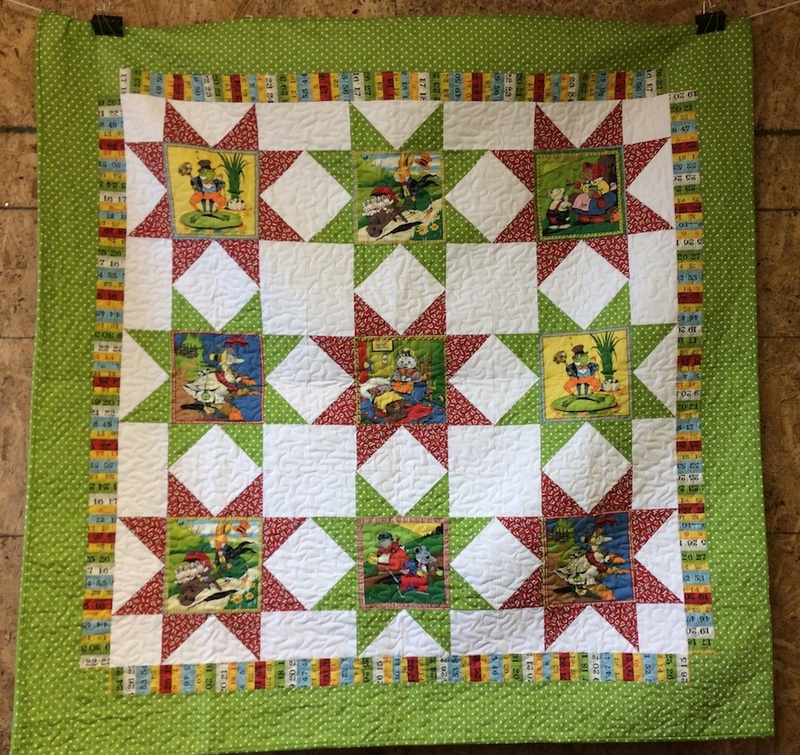 I picked #11 – this is a green & brown baby quilt that I made from leftover strips from quilts I made for my great newphews. I have backing fabric just need to quilt and bind. Once completed will donate at national convention of the Lutheran Women’s Missionary League in June. Thanks for the motivation. I love all your challanges and 350 Blocks – I don’t know how you have time to quilt just keeping up with all of these. OK, so you are my twin. I need something to help me focus. I’m in other challenges, but maybe this will be helpful to get me moving along. I picked a Scooby doo pillow that is just hanging around. I’ll donate it to my Mom’s bazaar the next time around. I have pillow form and all. 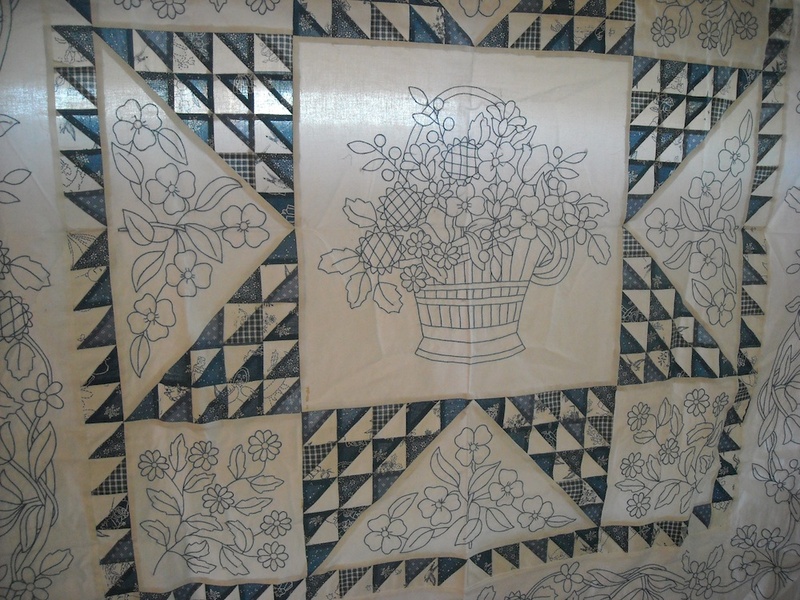 I did quilt and complete a project that was hanging in the works. I actually sent it off to a friend for her grandson. YAY!! I would love to complete something every single month. Not sure I can manage that, but I would certainly love to try 🙂 Great going girlfriend. Night January challenge was my starburst Christmas quilt to get the top finished and I did it. It is now waiting to go to the quilter. So I picked out a different number and I have my Halloween throw together. This month is number four and it is a star block of the month I need to decide if I’m going to make a setting squares or put in plain squares to have extra quilting. Oh, Shelly, that is too funny! At least you “touched” your project. I didn’t at all. So, I’m treating February as my “January” and starting over! I picked my Bonnie Hunter Grand Illusion Mystery as my project for the month. I got a good 2-hours on it last night. Yay! Well, I kinda got side-tracked making pouches for all my UFO’s and their pieces. So I didn’t make great headway with my January project, other than piecing the borders for it. But I’m feeling more organized. For this month, I’ll be working on #6 on my list…pj’s for my daughter that we picked out fabric for several years ago! My procrastination challenge for last months was a 1930s bom. I have the top done and I’m getting ready to sandwich it to quilt it by hand. It will be awhile before totally done. I did get four items off my UFOs list in January and already one in February. 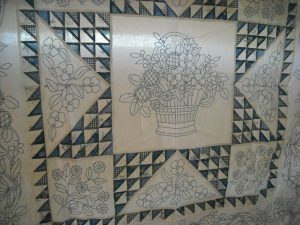 This month challenge project will be to sandwich and quilt a huge Dresden Plate. I had a friend remind me it is a short month, but I still am hopeful. I picked #3 on my list which is my simply adventours. From a box couple years ago I have several blocks done but have a long ways to go. I don’t like this quilt at all, but he does and that is the important thing.